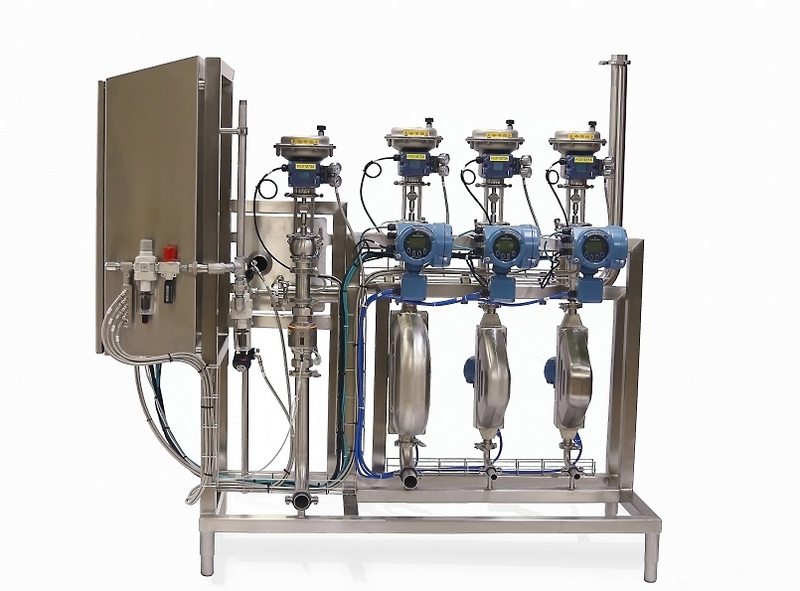 The JCS Continuous Standardizing is a digital in-line blending system that enables you to attain precise product specifications throughout the entire production run. Unlike ratio solutions that sometimes need to be “corrected” post-batch, we meter every step of the blending process and immediately correct any variances in real time. The JCS Continuous Standardizing in-line blender eliminates the need to hold multiple batch tanks for QC approval, which ultimately results in freeing up valuable floor space and reduced production time. It is a blend-to-bottle process that consistently gives a perfect formulation every time through higher resolution, faster response time, and our proprietary engineered algorithms. The system is installed in multiple configurations to meet your product needs. It can be installed from 2 streams up to 16 streams, at product flow rates from fractional gallons per minute (GPM) up to greater than 600 GPM throughput. Milk, juices, nectar, tea, sports drinks, whiskey, vodka, rum, beer, wine, tequila, brandy, soy sauce, among other spirits, foods and beverages.